Figure 1 is perhaps the most interesting chart I have ever made. The purpose of this figure (from my publication here) is to provide context into metrics of net energy and see how they relate to economic data. Here, I’m asking a fundamental question: should our (worldwide) society be able to leverage money more than we can leverage energy? My hypothesis is “no” and would be represented by values < 1 in Figure 1. Clearly the plotted ratio of ratios in Figure 1 is not less than one (for all years) per my hypothesis, so why might this be the case? As I discuss below, understanding the data in Figure 1 is crucial for making better macroeconomic models of the economy that properly account for the role of energy. Figure 1. This is a ratio of how much the worldwide economy leverages money spent by the energy sector relative to how much surplus energy is produced by the energy sector itself. Specifically this calculation (using world numbers) = (GDP/money spending on energy by the energy system) / [ (world primary energy production – energy spending by the energy system) / energy spending by the energy system)]. I created Figure 1 by dividing the data from Figure 3 by the data from Figure 2. Figure 2 is a calculation of the leverage of energy, and Figure 3 is a calculation of the leverage of money. I now describe each of Figure 2 and 3. For a full description of the underlying data and calculations, see Part 2 (and Part 1) of my papers in Energies in 2015. Net energy provides an additional lens, besides money, to understand how our economy works. Net energy is the amount of energy that is left over for consumption after we subtract the energy inputs that are required to produce that energy. The energy production and consumption quantities you see in statistical databases (such as those housed by the Energy Information Administration (EIA), BP, and International Energy Agency (IEA)) is gross energy, often referred to as total primary energy supply (TPES) consumed per year. For example, the world TPES is approximately 550 EJ as reported by the EIA. Figure 2 shows the data used in the denominator of the calculation of Figure 1. The solid red line indicates the average value for the world. The underlying data come from the IEA. This figure indicates that since around 1995, for every unit of energy consumed by the energy industry, the energy industry provides about 14-15 units of energy for all consumers and other industries. 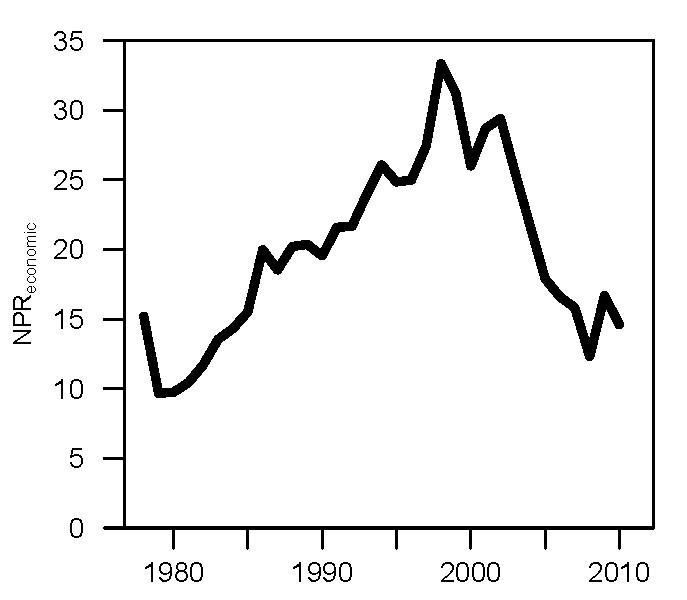 Before 1985, this “energy return on energy invested” was greater than 20 (data are not available to for a viable estimate before 1980). In the case of this figure, there are no other types of inputs considered besides energy itself. No wages. No materials. No computers or consultants. Nothing but energy. Figure 2. This is a ratio of how much net energy the worldwide energy system produces for all other sectors and consumers after it consumes the energy it needs for its own operation. The solid red line represents the world average. The dashed red line represents the average for OECD countries only. Each gray line represents the data for one country (the countries with high values are countries that are net energy exporters). Specifically this calculation (using world numbers) = [ (world primary energy production – energy spending by the energy system) / energy spending by the energy system)]. Figure 3 is about money, not energy. Consider adding up all energy spending (in money) by the worldwide energy industry and dividing that by the GDP of the world. A typical quantity is 0.04-0.07, or 4-7%. Essentially this is an input (spending by energy sector) divided by an output (GDP). In order to compare these monetary data to the net energy data of Figure 2, I need to phrase them in an equivalent manner. Figure 2 shows energy outputs divided by energy inputs. Thus, by inverting the monetary energy spending ratio, I turn it from a ratio of input/output to a ratio of output/input. Thus, if world energy sector spending was equivalent to 5% (or 0.05), 1 divided by this number is 20. Thus, we can say that the economic output of the economy is 20 times larger than the monetary spending of the energy sectors. Figure 3 plots this ratio for the world. Figure 3. This is a ratio of how much the worldwide economy leverages money spent by the energy sector. Specifically this calculation (using world numbers) = (world GDP / money spending on energy by the energy system). Fundamentally the ratios of Figures 2 and 3 are about measuring inputs of “something” to the energy industry in comparison to outputs of that “something” consumed or created by the rest of the economy. In Figure 2 the “something” is energy, and in Figure 3 that “something” is money. Figure 1 shows the data of Figure 3 divided by the data of Figure 2. Should the output:input (“leverage” or “return on investment, ROI”) of energy (often termed EROI) be greater than or less than the output:input (“leverage” or “return on investment”) of money? My hypothesis is that the energy ratio should be larger than the monetary ratio. Thus, the measure in Figure 1 should less than 1. The reasoning is as follows. The energy inputs used in Figure 2 only include energy consumed by the energy industry. As I wrote before, no other inputs such as wages, materials, offices, or administration are considered. By considering any number of these other inputs (and converting to units of energy), the energy return on investment ratio can only decrease. However, the assumption behind the monetary ratio of Figure 3 is that all types of inputs have been included in units of money. That is to say, the energy sector purchases inputs as energy, machines, and various services from itself and other economic sectors. Thus, there are many more inputs (theoretically all required monetary investments) considered in the monetary output:input ratio for the energy sector and economy. So back to my hypothesis that the ratio plotted in Figure 1 should be less than 1. How can we explain values > 1? The general (but not satisfying) answer is that GDP (gross domestic product) is a measure of economic throughput that is not backed by anything purely physical, but by what we (as consumers) perceive as valuable. Thus, we can value a service or product at one level in one year, but change our mind as to the value in another year. Much value is also currently placed in information-related companies (Facebook, IBM’s Watson, etc. ), and there is ongoing debate as to whether the value of this information (e.g., in social network companies) is overvalued. Is social networking overvalued, as a business, and will these valuations decline if people can’t actually afford to buy new products suggested by the ads targeting them? I suppose we don’t know the answer, and we’ll eventually find out. But I think debt accumulation is likely the best explanation for why the economy seems to be able to leverage money more than energy spending by the energy sector. To some degree, increases in debt in the 10-20 years leading up to 2008 (when the ratio in Figure 1 reached a value of 1) were responsible for increasing the quantity GDP. Government and consumer spending beyond their means shows up as increases in GDP. Also, if we consider increased debt a expectation of increased future consumption, and consumption (and production) require energy, then increases in debt are an expectation for increases in energy consumption. And don’t get confused here with discussions of “decoupling” energy from economic activity. There is yet no evidence that worldwide economic growth occurs without increasing total worldwide energy consumption. Possible evidence for this debt explanation is the fact that debt accumulation stopped in 2007/2007 (with the financial crisis and peak in commodity prices) when the ratio in Figure 1 was no longer greater than 1. If I were to have the data through 2015, my guess is that the number would have stayed near 1 through 2013/2014 before again increasing in 2014/2015 as oil prices were falling dramatically (assuming the energy return ratio of Figure 2 remained relatively steady). I also anticipate (could be confirmed by further research) that the ratio of Figure 1 would be < 1 for all years before 1980 leading to the beginning of the Industrial Revolution. Largely speaking, we extract the easiest to reach resources first, and these resources have high net energy (= low cost). Thus, resources with higher net energy translate to larger values for Figure 2 which is the denominator for Figure 1. Thus, smaller values of Figure 1. Further, I know from my previous research that spending on energy was never lower than around the year 2000 (see my papers here and here for detailed explanations), which is what is indicated in Figure 3 (e.g., the higher the value the cheaper was energy). Energy continually became less expensive since the beginning of the Industrial Revolution until the 1970s and then again (much slower) through the end of the 20th Century. Thus, the values for Figure 3 (the numerator of the calculation in Figure 1) will always be larger for the previous 100+ years. This concept of Figure 1 is so interesting because it is likely that the time period of 1985-2007 is unique in all of history as the time period when the economy leveraged monetary spending by the energy system more than the leverage in energy that was provided by the energy system. This is a ripe area for further understanding of macroeconomic modeling that properly accounts for the role of energy. This entry was posted in Blogs and tagged debt, economy, energy, net energy on April 15, 2016 by CareyKing. The following is an Energy Institute commentary piece coauthored with Dr. Josh Rhodes also of the University of Texas at Austin Energy Institute, January 2018. Our economic system operates within intellectual, social, and physical constraints. Each of these constraints can feedback to affect the others. To produce more goods and services we have to 1) know how to produce them, 2) make them desirable, acceptable and affordable, and 3) have the required natural resources. The finite size of the Earth increasingly affects socioeconomic outcomes across the globe, including within the developed economies. Ecologists, anthropologists, and systems scientists have anticipated this since the 1970s. However, the physical constraints on societal and economic organization and equality are largely unappreciated and misunderstood. This entry was posted in Blogs on February 2, 2018 by CareyKing. I’ll comment on two quotes from the Bloomberg article. I’ve commented on this before with regard to people discussing peak oil. Over the long-term, there is no difference between peak supply and peak demand. In order for Shell and others to extract more oil, consumers need to want and be able to purchase the refined products from that oil. Peak supply is defined by peak demand as much as peak demand is defined by peak supply. Ideally both supply and demand follow each other. But if they don’t to an “extreme”, then there are lower profits and layoffs in the industry (supply > demand) or recession can happen if demand > supply to a large enough extent (e.g., due to price rise in oil without time to substitute). Thus, peak oil demand (which we can’t actually define demand due to lack of data) IS a response to oil supply constraints and (a finite Earth more generally) in the long-term. If not, what else is responsible for the lack of purchasing power of consumers? If U.S. workers were getting paid higher incomes AND deciding not to purchase more oil AND working normal 40-hour work weeks, then we’d would have a reason to think about whether demand was being tempered by choice. Until then, the most logical conclusion is that consumer budgets are constrained, and these constrained budgets are not independent of resource constraints and increased difficulty for companies to make profits (thus lower margins and lower wages to save even those low margins). and expanding its newenergy businesses including biofuels and hydrogen, Henry said. While Simon Henry is not directly quoted here in discussing hydrogen as a substitute for oil, he does discuss biofuels. This is an absurd assertion that there will can simultaneously be a peak in demand for liquid fuels from petroleum but that for some reason consumers would still be able to afford to substitute biofuels (that have much lower net energy and are restricted by land use, even algae is limited due to low net energy) or hydrogen (which is not a primary fuel and is difficult to store). I do believe the world will continue to electrify (via renewable electricity) to reduce demand on hydrocarbons which can be used for physical material feedstocks as well as fuels. But please, let’s not tell people … still … that biofuels and hydrogen can substitute for oil anywhere in the next several decades. We need to have invested much much more into hydrocarbon-efficient end-use devices (e.g., electric vehicles) before we can afford even a fraction of current developed world lifestyles if we power any decent percentage of our economy on biofuels and hydrogen. Always remember, it is “energy price” x “energy consumption” = “energy expenditures”, compared to incomes and GDP that determine whether or not energy is expensive. To afford higher prices (e.g., $/BBL) you need to become more efficient for each BBL, and that efficiency is not at zero investment costs. This entry was posted in Blogs on November 16, 2016 by CareyKing. If you care to understand how the “energy part” of our economy feeds back and shapes the “non-energy part” of the economy, then this blog’s for you! Essentially every energy analyst and energy economist should understand the results of this paper. The findings of this paper have important implications for economic modeling in that the paper helps explain how fundamental shifts in resources costs relate to economic structure and economic growth. King, Carey W. Information Theory to Assess Relations Between Energy and Structure of the U.S. Economy Over Time. Biophysical Economics and Resource Quality, 2016, 1 (2), 10. doi: 10.1007/s41247-016-0011-y. View paper free online here: link, or download a pre-print draft: link. The reason why we care to understand the state of the economy, or other complex systems, in terms of efficiency and redundancy (or resilience) is that more efficient systems (that produce more output for increasingly fewer inputs) are also brittle. If conditions change, they are less able to adapt. 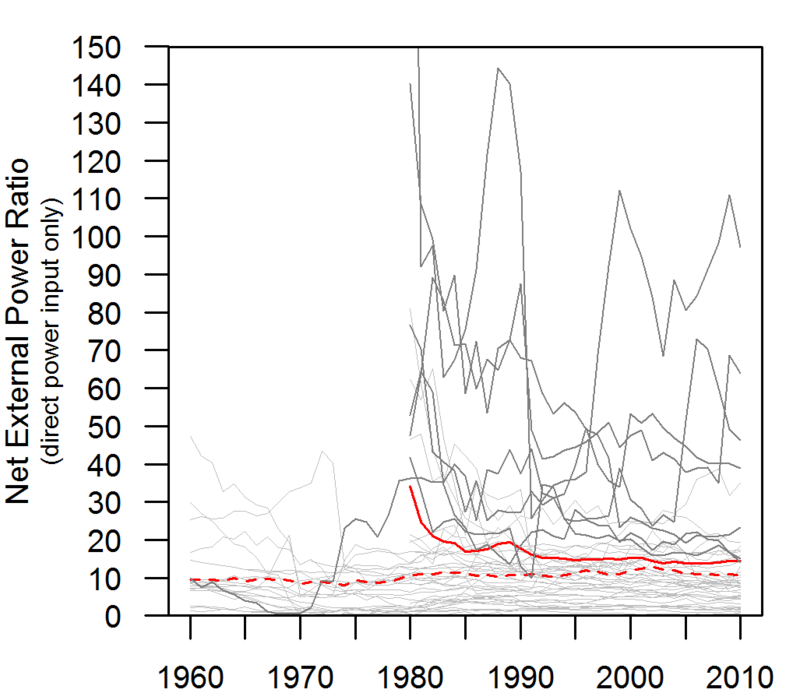 The same conditions that allowed them to greatly increase output with fewer inputs also force them to greatly decrease output when those fewer inputs are no longer available (e.g., oil imports are embargoed). In this paper, I put Tainter and other ideas relating to tradeoffs of “efficiency” and “redundancy” to the test. I did so using the concepts of ecologist Robert Ulanowicz, who has for a large part of his career worked on calculating the ‘structure’ of ecosystems using an information theory approach. I was immediately convinced that Ulanowicz’s framework could be applied to economic data to test Tainter’s concept and also test if there indeed was any relationship we could see between net energy and the economy. Thus, my paper describes the changing structure of the United States’ (U.S.) domestic economy by applying Ulanowicz’s information theory-based metrics (with some added twists I felt necessary to be more precise) to the U.S. input-output (I-O) tables (e.g., economic transactions) from 1947 to 2012. The findings of this paper have important implications for economic modeling in that the paper helps explain how fundamental shifts in resources costs relate to economic structure and economic growth. The results of this paper (summarized in Figure 1) show that increasing gross power consumption, as well as a less spending by food and energy sectors, correlate to increased distribution of money among economic sectors, and vice versa. In short, the ideas of Hall and Tainter appear to be true: the U.S. economic structure does change significantly depending upon (1) the rate at which we consume energy (e.g., power as energy/year) and (2) the relative cost of energy (and food)!! I will now explain in more detail how to understand the results in Figure 1 (see Appendix at the end of this blog to understand how the calculations work). In Figure 1, the “Net Power Ratio” (NPR) is a metric of “energy and food gain” that is larger when energy and food costs are lower. Its definition is: NPR = (Gross Domestic Product) / (Expenditures of Energy and Food sectors). Figure 1. After 2002, when energy, food, and water sector costs increased after reaching their low point, the direction of structural change of the U.S. economy reversed trends indicating that money became increasingly concentrated in fewer types of transactions. The information theory metrics indicate two time periods at which major structural shifts occurred: The first was between 1967 and 1972, and the second was around the turn of the 21st Century when food and energy expenditures no longer continued to decrease after 2002. The change in trend around 1967 (could possibly be described as 1972) is that equality shifts from increasing to decreasing. From 1945 until 1967/1972, both equality and redundancy were increasing. 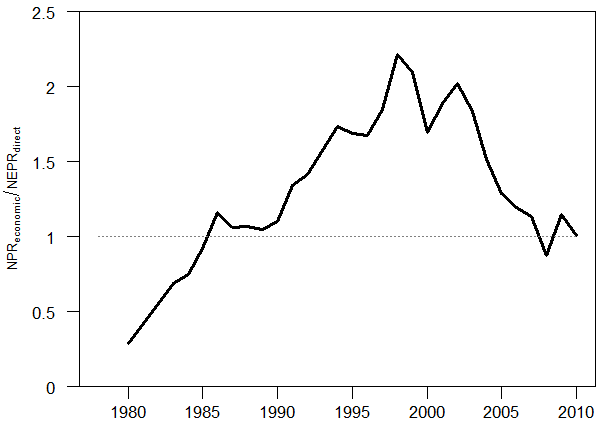 The U.S. was increasing its power consumption (e.g., energy/yr) at about 4%/yr. That is to say, the U.S. economy was booming after World War II gobbling up more and more energy every year at a high rate because energy (e.g., oil) was abundant and getting cheaper by the day. Increasing equality means that over time each sector of the economy was coming closer to the condition that each sector had approximately the same total sales in a year. That is to say, the sales of the “construction” sector were becoming more equal to the sales of the “aircraft and parts” and “amusement” sectors. Some sectors would sell less over time (e.g., “farming”) and some sectors would sell more (e.g., “metals manufacturing”). This makes sense because some “new” sectors have practically no transactions in 1954 whereas they are more integrated into the economy in 1967 (e.g, “aircraft and parts” and “amusement”). Increasing redundancy means that over time each sectoral transaction (e.g., “farms” to “metals manufacturing” or “oil and gas” to “machinery and equipment manufacturing”) was becoming more equal. This again makes sense because some “new” sectors have practically no transactions in 1954 whereas they are more integrated into the economy in 1967. U.S. had little global competition for resources in immediate aftermath of World War II (e.g., Europe and Japan were devastated and needed time to recover). Oil: Peak U.S. crude oil production in 1970 enabled the Arab oil embargo of 1973, and OPEC’s increase in posted oil price in 1974, to raise oil prices to such a degree as to cause a significant decrease in global oil consumption. Efficiency and environmental controls enacted for the first time: The Clean Air Act (1970) and Clean Water Act (1972) were substantially increased in scope and enforcement. The environmental and energy changes encouraged significant investment in utilities (e.g., wastewater treatment) and resource extraction along with a focus on consumer energy efficiency for the first time since industrialization. One of the theories of ecologists (e.g., Howard T. Odum and Robert Ulanowicz) is that systems must have some “structural reserves” in existence to be able to respond to resource constraints or other disturbances that might occur in the future. The major change that occurred in 2002 was that energy and food no longer continued to get cheaper. If you’ve followed my work, you know this already (see my blog from 2012)!!! As I’ve stated in even more detail in my papers in 2015 (Part 2 and Part 3 of 3-part series in Energies) this is the defining macro trend of the Industrial Era (no, really …). In response to this second structural shift from energy and food costs, it is clear that the U.S. economy did trade off structural reserves for efficiency. Efficiency is the opposite of redundancy in Figure 1, so that the efficiency of the economy decreased all the way to 2002 after which it started increasing efficiency. The U.S. economy decreased structural redundancy and equality for structural efficiency (e.g., increasing metrics of efficiency and hierarchy) after food and energy expenditures increased post-2002. So after 2002, the U.S. economy (and by my inference, the same thing is happening in each world economy overall) had to shift money into FEWER sectors and FEWER types of transactions. China had entered the World Trade Organization in 2001 and started to become the world’s manufacturer. This decreased monetary flows to domestic manufacturing. Financial deregulation in the 1990s, including the Gramm–Leach–Bliley Act of 1999 which repealed the Glass-Steagall Act, increased the monetary flows to the financial sectors. These two effects (China and financial deregulation) led to increased demand and speculation for energy and commodities, so that monetary flows increased to the oil and gas sector (remember the highest oil price of $147/BBL in July of 2008 during the height of the Great Recession) to meet U.S. and global demand. APPENDIX: How to interpret the results in Figure 1 via the methods of the paper. – Example sectors are “oil and gas sector” and “farming”, etc. FIgure 2. 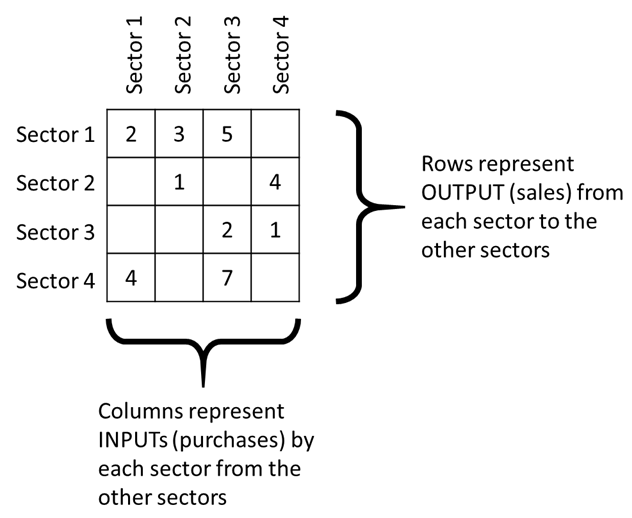 The economy’s transactions are often viewed via the “input-output” table where each entry represents how much of a given sector (on the column) purchases from a given sector (on the row). A highly redundant economy (or system or network of flows) interacts with many of the possible partners in many ways and relatively equally (Figure 3 – LEFT). This might not be the best for growth, but you have “backups” in case things go wrong with one of your partners. A highly efficient economy (or system or network of flows) interacts with fewer possible partners such that there are fewer sectors or people to deal with to get things done (Figure 3 – RIGHT). This efficiency can, and typically does lead to increased potential for growth. Figure 3. 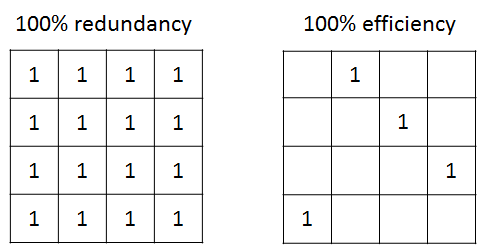 What the distribution of monetary flows (from one sector to another) looks like for an economy (or generically a network of flows) that is fully, or 100%, redundant (LEFT image) and one that is fully, or 100%, efficient (RIGHT image). The numbers don’t have to be all “1”, they could be any number that is the same. A highly equal economy (or system or network of flows) interacts with many of the possible partners in equal manners such that every sector or actors sells and buys the same total amount of goods and services (Figure 4 – LEFT). 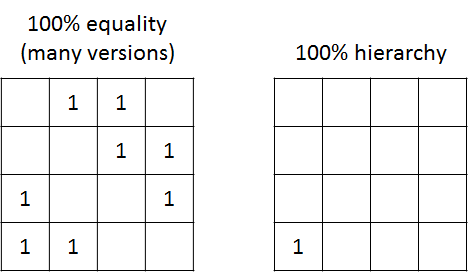 Note that both the images in Figure 3 are also 100% equal. This is not a practical expectation because we can easily understand structural relationships among economic sectors that will prevent equality (e.g., the “oil and gas extraction” sector sells most of its products to the “refined oil products” sector). A highly hierarchical economy (or system or network of flows) has a small number of sectors that dominate the transactions and monetary flows (Figure 4 – RIGHT). In the extreme case of FIgure 4 – RIGHT, there is only one type of transaction that occurs (Sector 1 purchasing stuff from Sector 4) and the economy actually no longer is defined the same (e.g., Sectors 2 and 3 don’t effectively exist since they have no transactions). Figure 4. What the distribution of monetary flows (from one sector to another) looks like for an economy (or generically a network of flows) that is fully, or 100%, equal (LEFT image) and one that is fully, or 100%, hierarchical (RIGHT image). The numbers don’t have to be all “1”, they could be any number that is the same. This entry was posted in Blogs on November 5, 2016 by CareyKing. Part one of this blog post explained how macroeconomic models are flawed in a fundamental way. These models are coupled to models of the Earth’s natural systems as Integrated Assessment Models (IAMs) that are used to inform climate change policy. Most IAM results presented in the Intergovernmental Panel on Climate Change (IPCC) reports show climate mitigation costs as trivial compared to gains in economic growth. The referred to “elephant in the room” (from part one of this series) is the fact that economic growth is usually simply assumed to occur. No matter what the quantity or rate of investment in the energy system or the level of climate damages, the results indicate that economy will always grow. This defies intuition, and begs the question: If the costs of climate mitigation really are so small, then why is there so much disagreement over a low-carbon transition? One way to explain the problem is via a term called “total factor productivity,” or TFP. TFP is the Achilles Heel of macroeconomics, and why no one talks about the aforementioned elephant with the exposed heel in the macroeconomics classroom. Essentially economic output, or GDP, is usually modeled as being dependent upon the amount of labor in the workforce, the amount of capital (e.g., factories, machines, computers, buildings), and TFP. TFP can be understood as all of the reasons why the economy grows that are not already characterized by the quantity of labor and capital. In statistical terms it’s called a “residual,” or the amount unexplained by an assumed underlying equation of economic growth. TFP is often projected to continue (based upon trends from historical rates) at around 1.5 percent annually. Because labor and capital change relatively slowly (aside from events such as wars, a quick rise in sea level, or other similar “events”), this TFP assumption effectively assumes a large amount of growth into the future. Further, the assumption of a historical annual rate of increase in TFP is inherently independent of energy-related factors (see IPCC report “Climate Change 2014: Mitigation of Climate Change”). Thus, the normal IAM assumption is inadequate because it presents the case to policy makers that even dramatic increases in energy investment for a low-carbon energy transition don’t affect TFP and hence economic growth. This is a problem since it makes the transition appear trivial. It’s incorrect, however, to assume TFP will continue into the future just as it had in the past because the past was a time of increasing carbonization of the economy. It is too much of an extrapolation to assume TFP will be the same during decarbonization. A significant body of research indicates that accounting for both energy and its conversion efficiency to physical work (e.g., engines and motors) and other energy services (e.g., light) can explain the vast majority of TFP. That is to say, instead of assuming an increase in TFP into the future that is independent of the modeled energy technology investments, we could assume a series of low-carbon energy technology investments and estimate the effect on TFP, thus economic growth, from the bottom up. TFP is effectively composed of the effects of machines and energy substituting for human labor. A human pushing a button on an electrified machine is more “productive” than that human turning a crank by hand on that same machine. Part of the reason why TFP, and its cousin labor productivity (= economic output / hour of labor), have been decreasing in the last decade is due to declining energy consumption and slower improvements in efficiency. There are still a lot of low-hanging fruit, however, we already picked the ripe fruit that fell to the ground. And, it still takes effort to pick even the low-hanging fruit. There is no free (fruit) lunch. Aside from a need to develop more accurate macroeconomic models that explicitly account for the role of energy, there is a larger concern in regard to sustainability. The modeling improvements discussed in this post relate to the economic and environmental (e.g., climate, energy) pillars of sustainability. Existing models, however, also inhibit discussion of equity, the third pillar. If we convince ourselves that we will always grow in the future, no matter what, then we can more easily convince ourselves that we can defer the question of sharing until the future, until after we’ve figured out growth for now. This is exactly why the exogenous TFP assumption is socially dangerous. That said, we know a number of things for certain. The Earth is finite, and we know we cannot have infinite growth on a finite planet. Thus we need physical and economic models that also reflect this reality. Unfortunately, we’re using economic models that ignore this reality. Why should we make policy using economic models that don’t reflect what should be obvious to a third-grader? We can do better, and we must do better if we want realistic economic assessments of a low-carbon energy transition. If we don’t want realistic assessments, then we can continue the status quo, which is to explain the future economy by projecting a factor (i.e., TFP) defined as what cannot explained by insufficient theory. This entry was posted in Blogs on September 21, 2016 by CareyKing. This blog was written for the Cynthia and George Mitchell Foundation, and originally appeared here: http://www.cgmf.org/blog-entry/213/. This entry was posted in Blogs and tagged climate, economics, energy, IPCC on September 14, 2016 by CareyKing. Keep Austin Weird. The mantra is everywhere – on shirts, coffee mugs, and bumper stickers. And yet Austin seems to be losing its weirdness. Downtown music venues are struggling. Leslie, the scantily clad, homeless, former mayoral candidate, has passed. Perhaps the clearest sign of losing our weirdness is that Austin hosts a Formula 1 race – a combination of glamour and technology that leaves no trace of “weird” in its tracks. But such are the challenges of a growing city. Some weirdness remains. Just take a look at the early mornings at Barton Springs pool. Austin is the largest city that doesn’t host a major league sports team. And we still have vibrant movie rental stores. But I think we need a new mantra: Make Austin Wealthy – and by “wealthy,” I mean emphasizing all kinds of assets, and by “Austin” I mean every person and neighborhood in Austin. Most of the time when we think about wealth we think of money, or financial capital. We also usually consider how many assets we own either individually (home, car, etc.) or collectively (buildings, roads, water and energy system, etc.) This is built or physical capital. But there are other forms of capital that we need to consider to ensure a vibrant community, economy or city. Natural capital is the water, land, trees, animals, clean air and other natural resources that surround us. Political capital is access to structures of power and the ability to influence rules that shape the distribution of resources, such as the district-based representation on the Austin City Council. There is human capital: Austin has this in spades – the sum total of knowledge and skills acquired through educational channels. And we have cultural capital: cultural understandings and practices that shape how we grasp the world. Keep Austin Weird was about buying local to maintain local character. The increasing social tensions in various cities across the United States is the reason why these ideas are important. These tensions are sometimes manifestations of racial injustice, voter redistricting, or income stagnation and inequality, among other drivers. No one wants increased social tension in Austin, but Austin is not immune. At least one study shows that the Austin metro area is among the most economically segregated in the country. We should ensure that the rising tide of Austin’s prosperity lifts all canoes on Lake Austin, not only yachts on Lake Travis. But there are global pressures as well. Since the beginning of the Industrial Revolution, the cost of the core goods of energy and food were getting cheaper until around the year 2000. After 2000, they have become slightly more expensive. For 200 years, human ingenuity, beginning with the advent of the steam engine for producing coal, had continually enabled us to prosper while making our core needs more affordable. But since 2000, no longer. This and other feedbacks from our finite Earth are applying pressure to separate local communities, between those adapted to a globalized world and those that are disconnected. We hear this in the speeches of both Donald Trump and Hillary Clinton. They both claim to be against new free trade treaties. However, Pandora’s Box has been opened, we can’t put globalization back into it without some ramifications. We usually focus on increasing wealth, and we still can and should. But what we can more directly choose is how to share all various forms of wealth that we have, no matter how much there is. The past century was about unrestricted growth in a resource-abundant world. This next century is about reorganizing an increasingly unequal society in an increasingly resource-scarce world to enhance cooperation. Austin’s smart. Austin’s still a little weird. Perhaps the weirdest thing we could do is to become the best city in the world at spreading the wealth. Let’s increase the distribution of capital within our capital city. Keep Austin Weird by Making Austin Wealthy – all of it. Carey W. King is Research Scientist and Assistant Director of the Energy Institute at The University of Texas at Austin. This entry was posted in Blogs and tagged economy, equity, nature, wealth on September 4, 2016 by CareyKing.